According to Lambda Cold Dark Matter (ΛCDM) cosmology, structure in the Universe grows from the bottom up. Dark Matter, which makes up 27% of the mass-energy of the Universe, gathered into the first structures in the cosmos, dwarf galaxies. These cosmic “building blocks” subsequently merged to form larger galaxies such as our own cosmic home: the Milky Way Galaxy. There is general agreement between ΛCDM predictions and observations. Evidence of such mergers can be seen in the existence of dwarf galaxies around large galaxies like ours and others, as well as faint streams, filaments and tails, the remnants of past mergers. Also, astronomers have in recent years observed clusters of dwarf galaxies which may be in the process of merging. But the ΛCDM model predicts that we should see more of these satellite dwarf galaxies and more structure left-over from mergers than we currently observe. One explanation for the discrepancy may be that we are simply not seeing the satellite galaxies and merger remnants because they aren’t bright enough for current telescope and instrumentation technology to detect. Such features are described as having low surface brightness, and even in today’s most advanced reflector telescopes, internal diffraction, scattering and reflection of light result in a background brightness that can hide them. The Dragonfly Telescope Array is designed to detect low surface brightness objects that go undetected in other telescopes. It comprises 48 commercially available Canon 400mm telephoto lenses with lens-coatings that minimize scattered light and internal reflections. The light sensitivity of each lens—in photographic parlance, the speed—is further increased with each added lens. Dragonfly was conceived and built by a team led by U of T’s Prof. Roberto Abraham and Yale University’s Prof. Pieter van Dokkum. With Dragonfly, Abraham, van Dokkum and their colleagues have discovered a new class of low surface brightness galaxies they named Ultra-Diffuse Galaxies. 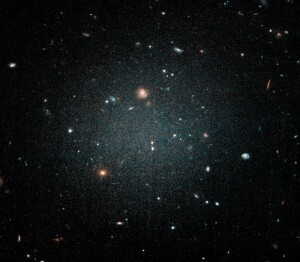 They have found both a galaxy (Dragonfly 44) that appears to be made mostly of dark matter, and recently, a galaxy (DF2) which appears to contain virtually no dark matter. 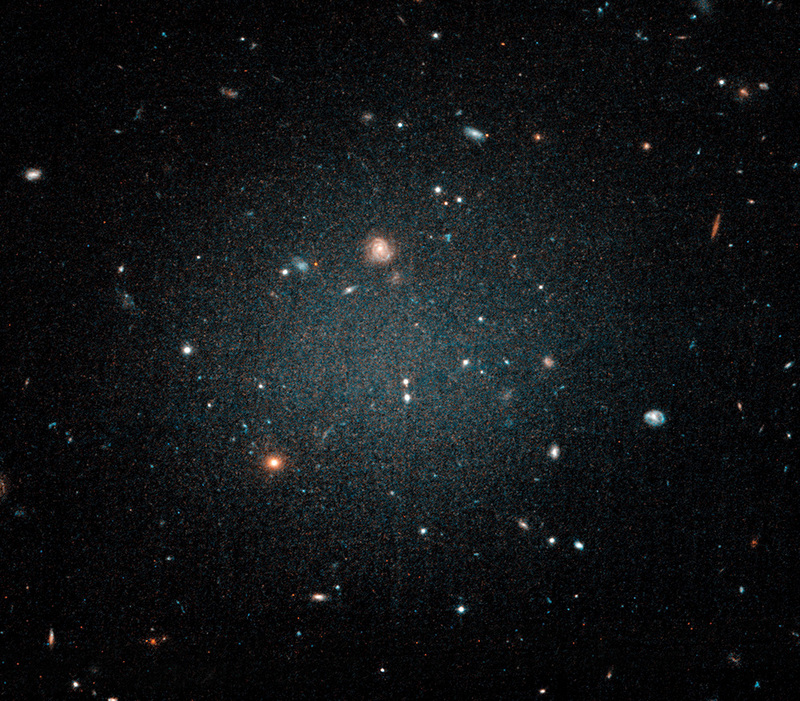 How Do You Make a Galaxy without Dark Matter?